A full design proof will be supplied for your approval prior to production. Asset labels and stickers. Part of our Asset and numbered label range. 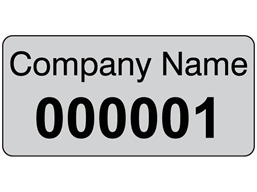 Assetmark tamper evident label with single line of custom text (upto 12 characters), and consecutive number sequence. Material self adhesive tamper evident polyester (which leaves pattern on attempted removal), with laminated surface. Supplied in rolls of 500 labels. Serial number labels. Assetmark tamper evident. Consecutive serial number with single line of custom text (upto 12 characters) in black. SQ01 Size 12mm x 25mm. Material self adhesive tamper evident polyester.